This graph shows that the probability of observing a value of lambda equal to or greater than the measured value (dashed vertical line) is very small. 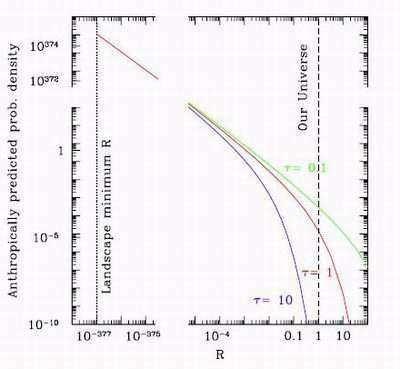 The three lines represent the anthropically predicted probability density distribution as a function of R, the ratio of the cosmological constant in another part of the multiverse to that in our Universe in Starkman and Trotta’s MANO scheme. T controls the cosmic time when intelligent life emerges, with T=1 representing our Universe. Credit: American Physical Society. Many scientists never liked it anyway, and now Glenn Starkman from Oxford/Case Western and Roberto Trotta from Oxford show that too many details—and too many unknowns—mean that anthropic reasoning gives inconsistent values of the cosmological constant, some that are far from current estimates. In their recent paper, “Why Anthropic Reasoning Cannot Predict Lambda” (Physical Review Letters), Starkman and Trotta find that different ways of defining the probability of observers in different universes leads to vastly different predictions of the cosmological constant. According to the Anthropic Principle, the fact that we are here to observe the universe explains why the laws of nature are what they are. Some scientists point to a great deal of coincidences to support this idea: the perfect strength and relation of the four forces; the many components producing carbon-based life; and the energy density of the universe driving its expansion (aka “lambda”). Add all this up, proponents argue, and it’s pretty unlikely that you should be here today. Not to mention that the Anthropic Principle seems to fit nicely with many popular theories, such as string theory and the multiverse. Prior to Starkman and Trotta, people have taken issue with anthropic reasoning, although most of these arguments have been qualitative (with exception of a few very recent studies). For instance, explaining that things are what they are because of the way things are, doesn’t seem to get us anywhere. In addition, anthropic reasoning narcisstically ignores the possibility of non-carbon-based life. And why must the universe have been created to support life—why not see it as humans adapting to the universe, since natural selection decides which types of life are the best survivors? The question of the paper, then, is how to determine the number of observers in a universe and the number of measurements they could make—a number that cannot be measured directly, but which one must try to deduce despite the large number of unknown contributing factors. There are so many factors (e.g. number density of galaxies, baryons in halos, holographic arguments), in fact, that Starkman and Trotta argue that one’s prediction of the cosmological constant with anthropic reasoning depends “enormously” on the different ways of weighting all the factors. Because no single weighting scheme provides a fundamental advantage over any others, they argue, this lack of definition disqualifies anthropic reasoning. To demonstrate, Starkman and Trotta introduce a new weighting factor called the “maximum number of allowed observations” (MANO) in a universe. “This maximum number is the product of two factors—the number of observers and the maximum number of observations that each observer can make,” the scientists write in their study. Starkman and Trotta limit the number of observations per observer by calculating the maximum number of thermodynamic processes a living thing could perform in a lifetime under ideal conditions. Based on this energy-consuming picture, the scientists then limit the number of observers so that each can utilize all the energy in its surroundings without having to share (called the “rare observer limit”). They explain that if the number of observers increased, the energy per observer would decrease due to competition, waste, warfare, and thus wasted energy. Of course, the real outcome of overpopulation is unpredictable—but, the paper argues, this inability to predict the results of higher observer density further compromises the abilities of anthropic reasoning. Finally, the result which this anthropic reasoning gives: Starkman and Trotta measure that the probability of the anthropically predicted lambda being greater than or equal to the currently observed value (about 0.7) is one in 100,000. This result differs dramatically from the anthropic predictions proposed by Steven Weinberg, in predictions from 1989 (in his seminal paper on anthropic reasoning), to the present. Weinberg predicted a result larger than (though more similar to) current observations. Still other approaches have predicted much larger values. Starkman and Trotta explain that at least two assumptions of anthropic reasoning contribute to its flawed results. At its most basic level, anthropic reasoning uses the concept of probability to place limits on lambda. Perhaps, though, probability cannot apply to the entire universe, as the universe is not a lab where repeatable experiments are performed. Secondly, as the scientists write, anthropic reasoning depends heavily “on poorly understood microphysical processes involved in the evolution of life, especially of conscious beings interested in making observations of the fundamental constants.” Even expert biologists can hardly be sure of the various intelligence levels of animals on this planet. As a far-fetched illustration, we can’t eliminate the possibility that ants (or more aptly, aliens) will one day make their own measurements of the cosmological constant, can we? However, just because scientists have not found a weighting factor that would give an accurate prediction of lambda, might not rule out the possibility that a “correct” weighting factor could, in principle, exist. Starkman and Trotta have their doubts, though, not only on this possibility, but also on how valuable knowing the factor would be. Citation: Starkman, Glenn D., and Trotta, Roberto. “Why Anthropic Reasoning Cannot Predict Lambda.” Physical Review Letters 97, 201301 (2006). Reprinted figure with permission from Starkman, Glenn D., and Roberto, Trotta. Physical Review Letters 97, 201301 (2006). Copyright 2006 by the American Physical Society. Readers may view, browse, and/or download material for temporary copying purposes only, provided these uses are for noncommercial personal purposes. Except as provided by law, this material may not be further reproduced, distributed, transmitted, modified, adapted, performed, displayed, published, or sold in whole or part, without prior written permission from the publisher.